Solaris was my first exposure to the Unix world way back in 2004-2005. It was again in 2008-2009 that I had a chance to play with Linux. I installed Ubuntu and spent time with Ubuntu 8.10 and went through to 10.10. The latest I used it was in 2011. Even though I hoped to become comfortable with it, but never took it all the way. I just used it as a regular PC. When I read that CrunchBang was a great distro for old hardware, I wanted to give it a shot again. It was on Sep 9 2011 that I have asked on unix.stackexchange.com which distro to go with and people told me that Crunchbang was just great. I downloaded CrunchBang (Statler) the same day. But at the time, I had already set my mind on Linux Mint and was yet again confused. Why are people suggesting me Crunchbang? A dark looking Linux? Really? Over the last few days, I was itching to install what I had with me (the crunchbang iso) thinking I can just dump it if I don't like it and try Linux Mint as I had originally wished to. The whole installation finished in about 20 minutes. The post installation in about 40 minutes (owing to my download speed). While the post installation script was progressing step by step, I kept discovering the features. 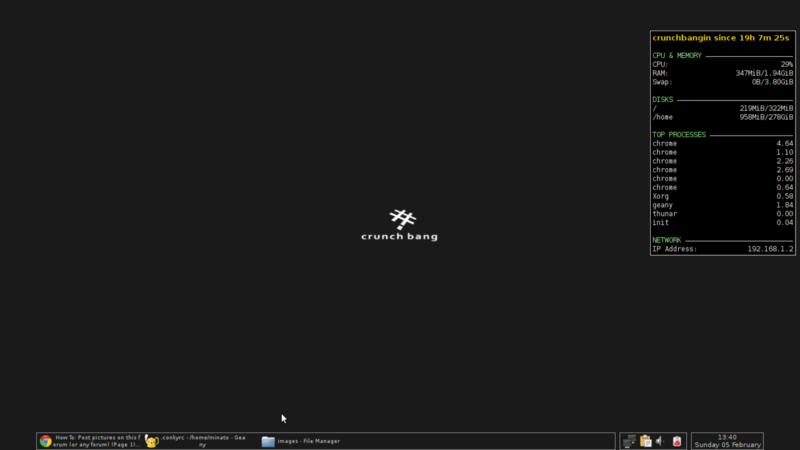 just installed crunchbang linux on my laptop. its a quick install. completed in about 20 minutes total. love the login screen. it is a dark screen with a single textbox in the middle of the screen. noticed i am not able to tap the laptop touchpad to click things. i also noticed that by default there are two desktops. i got prompted by a post installation script after i logged in. screen 1 of 12: welcome screen welcome screen told me that certain things can be configured right now. if i want to run it later, the command is cb-welcome. screen 2 of 12: update software sources screen. it checked internet connection and then asked to update s/w sources. i started playing around with the help of the shortcut list shown in conky. screen 3 of 12: update installed packages screen. this runs sudo apt-get dist-upgrade. this step is taking a while. 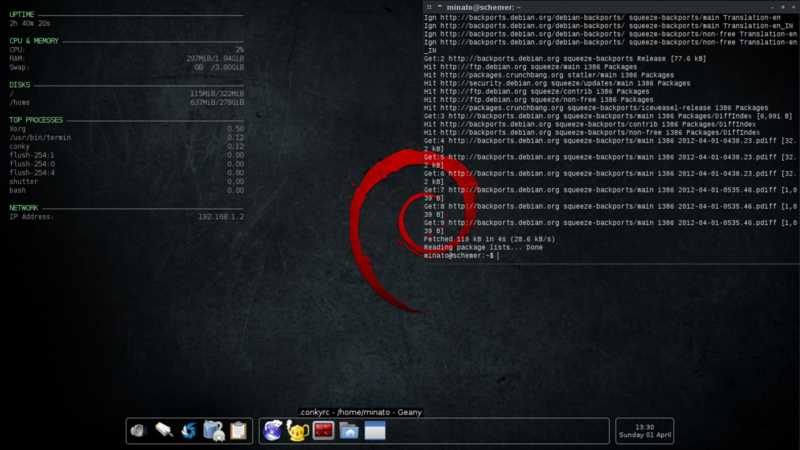 i noticed conky showing system info like hostname, uptime, RAM, swap usage, disk usage, CPU usage. looking at the main menu (accessed by pressing super+space, it felt like i have been taken back in time. yet the whole thing is so simplistic. i am already liking it. screen 4 of 12: printer support screen. skipped. yes i will come back soon. jre install is taking time. i discovered that main menu can also be accessed by right-clicking on desktop. meanwhile opened the wallpaper changing window and it was brilliantly minimal. i love it. tried scrolling down using the scroll section of touchpad and was successful. very cool. screen 6 of 12: install libreoffice screen. not doing it now. skipped. screen 7 of 12: install development packages screen. i hit enter to proceed to view said packages. screen 8 of 12: install version control tools screen. it showed git mercurial subversion bzr cvs, but i was not sure if it would show more option to install these one by one or all at once. since i needed only mercurial, i skipped this step. screen 9 of 12: install ssh server screen. not sure if needed it, yet agreed to install it. was a quick install. screen 10 of 12: install lamp stack screen. no python option given, so do not want. screen 11 of 12: install developer environment for debian packaging screen. not needed. screen 12 of 12: finish screen. done with post installation script. navigated the alt-menu. did not figure out how to activate or use the packages shown in the alt-menu. also realized that the window manager is dwm 1 and the desktop environment is openbox, which is neither gnome nor kde. it seemed fine. played around a bit with geany, the editor. found the synaptic package manager from the main menu. accidentally pressed super+m instead of super+d for minimizing desktop. i was happy to see vlc show up as the default media player. when navigating the main menu some more, found links to install chrome, opera and dropbox! how convenient! realized that sub-menu categories in the main menu are right-aligned, while the actual item is on the left as usual. this felt weird at first. Edit (Jan 23 2012) 1 CrunchBang doesn't have dwm by default. It has X window manager. It felt a lot different than Ubuntu. A lot lighter and minimal. It was awesome. I knew instantly that I have finally found my Linux. A Linux that I could fall in love with. A Linux that I could grow old with. A Linux in which I would become a Guru level user. My sincerest thanks go to the people who were behind the creation of CrunchBang. I look forward to becoming a contributor to CrunchBang in the near future. Switching over to Linux means living a lot on the command line and dealing with configuration files. So having a blog to record my experiences is certainly not a bad thing.